Security forces thwart attempt to smuggle into Gaza 'dual use' substances for making explosives. 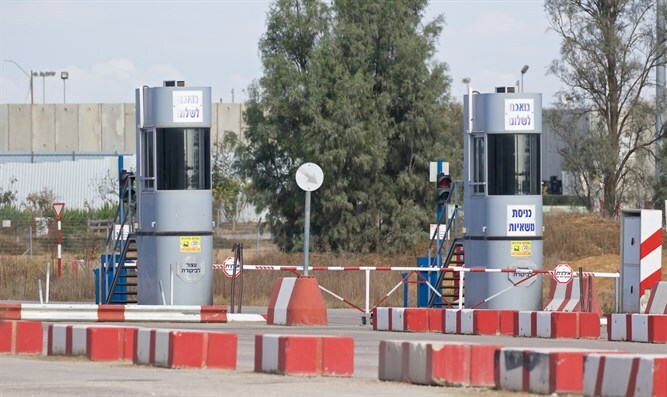 This week, Ministry of Defense Crossing Authority officials at the Kerem Shalom crossing thwarted an attempt to smuggle crates containing dual use substances used in the creation of explosives and explosive devices. The materials were discovered within a shipment of medical equipment en route to the Gaza Strip. The materials seized by the examiners were taken to a laboratory for testing. The lab identified the substances as a central component used in the preparation of explosive charges and in the high-trajectory industry within the Gaza Strip. An investigation is currently being carried out by the Israeli Police and other security forces. The laboratory for substance identification was set up several months ago at the Kerem Shalom crossing in order to locate problematic materials whose entry into the Gaza Strip is forbidden for fear of reaching terrorist forces. Using advanced equipment, the lab tests a wide range of materials, including gases, liquids, powders, solids, metals and others before they enter the Gaza Strip. The state-of-the-art laboratory is a joint project of the MOD Crossing Authority, the Israel Security Agency, and Israel Police Crossing Department of the Israel Police- whose operational purpose is to identify the type of material within as short a time frame as possible from the point of sampling. This is in order to minimize the danger to crossing officials, but also to improve the quality of service and minimize as much as possible any delays in the entry of goods into Gaza. This discovery joins the dozens of smuggling attempts foiled by Kerem Shalom Crossing Authority employees during 2017.